How to Carve Your Turkey. Mickey first was seen in a single test screening (Plane Crazy). Mickey officially debuted in the short film Steamboat Willie (1928), one of the first sound cartoons. He went on to appear in over 130 films, including The Band Concert (1935), Brave Little Tailor (1938), and Fantasia (1940). Mickey appeared primarily in short films, but also occasionally in feature-length films. Ten of Mickey’s cartoons were nominated for the Academy Award for Best Animated Short Film, one of which, Lend a Paw, won the award in 1942. In 1978, Mickey became the first cartoon character to have a star on the Hollywood Walk of Fame. Mickey generally appears alongside his girlfriend Minnie Mouse, his pet dog Pluto, his friends Donald Duck, and Goofy, and his nemesis Pete, among others. Originally characterized as a mischievous antihero, Mickey’s increasing popularity led to his being rebranded as an everyman, usually seen as a flawed, but adventurous hero. In 2009, Disney began to re-brand the character again by putting less emphasis on his pleasant, cheerful side and reintroducing the more mischievous and adventurous sides of his personality, beginning with the video game Epic Mickey. 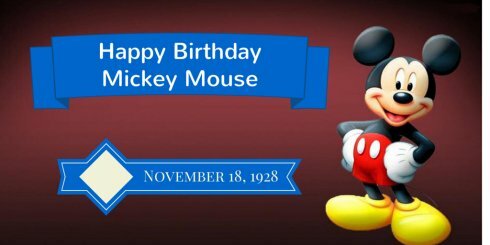 Mickey Mouse was created as a replacement for Oswald the Lucky Rabbit, an earlier cartoon character created by the Disney studio for Charles Mintz, a film producer who distributed product through Universal Studios. In the spring of 1928, with the series going strong, Disney asked Mintz for an increase in the budget. But Mintz instead demanded that Walt take a 20 percent budget cut, and as leverage, he reminded Disney that Universal owned the character, and revealed that he had already signed most of Disney’s current employees to his new contract. Angrily, Disney refused the deal and returned to produce the final Oswald cartoons he contractually owed Mintz. Disney was dismayed at the betrayal by his staff, but determined to restart from scratch. The new Disney Studio initially consisted of animator Ub Iwerks and a loyal apprentice artist, Les Clark, who together with Wilfred Jackson were among the few who remained loyal to Walt. One lesson Disney learned from the experience was to thereafter always make sure that he owned all rights to the characters produced by his company. In the spring of 1928, Disney asked Ub Iwerks to start drawing up new character ideas. Iwerks tried sketches of various animals, such as dogs and cats, but none of these appealed to Disney. A female cow and male horse were also rejected. They would later turn up as Clarabelle Cow and Horace Horsecollar. (A male frog, also rejected, would later show up in Iwerks’ own Flip the Frog series.) Walt Disney got the inspiration for Mickey Mouse from a tame mouse at his desk at Laugh-O-Gram Studio in Kansas City, Missouri. In 1925, Hugh Harman drew some sketches of mice around a photograph of Walt Disney. These inspired Ub Iwerks to create a new mouse character for Disney. “Mortimer Mouse” had been Disney’s original name for the character before his wife, Lillian, convinced him to change it, and ultimately Mickey Mouse came to be. The actor Mickey Rooney claimed that, during his Mickey McGuire days, he met cartoonist Walt Disney at the Warner Brothers studio, and that Disney was inspired to name Mickey Mouse after him. This claim however has been debunked by Disney historian Jim Korkis, since at the time of Mickey Mouse’s development, Disney Studios had been located on Hyperion Avenue for several years, and Walt Disney never kept an office or other working space at Warner Brothers, having no professional relationship with Warner Brothers, as the Alice Comedies and Oswald cartoons were distributed by Universal.